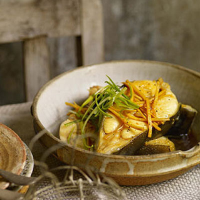 This homely dish is traditionally made with catfish, but I have used halibut. Although it only takes minutes, it’s certainly worthy of dinner parties and is lovely with steamed rice and a braised green vegetable. Serve with lime halves. Sprinkle the sugar over the base of a claypot or casserole dish and add 2 tbsp water. Heat gently to dissolve, then increase the heat and cook until a dark, golden caramel forms. Add the oil, garlic and ginger, stirring, for 1 minute. Reduce the heat and add 100ml hot water, the fish sauce and the halibut steaks, seasoning with a little salt and plenty of black pepper. Turn the fish to coat it with the sauce. Cook for 1–2 minutes, then carefully turn the fish over again and cover the pot with a lid; cook for about another 3 minutes. Remove the lid, increase the heat and allow the sauce to bubble and thicken for 1–2 minutes. Serve, topped with shredded salad onion greens.